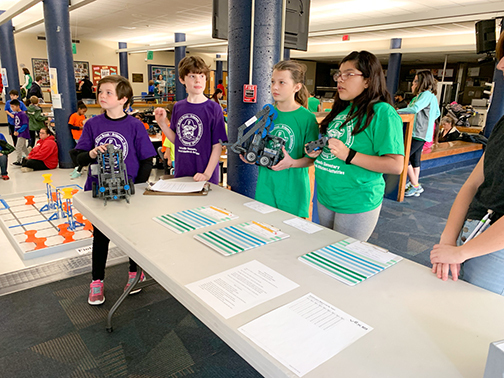 The Pattonville School District fostered an early love of robotics and problem solving by offering its first elementary Vex IQ Robotics League for students in third through fifth grades this fall. 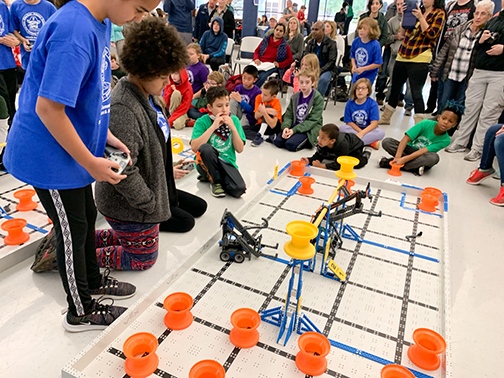 Approximately 70 elementary students from throughout the district participated in a six-week robotics league and took part in the culminating league competition on Nov. 3 at Holman Middle School. The interdistrict scrimmage included 14 teams from Bridgeway, Parkwood, Rose Acres and Willow Brook elementary schools, Remington Traditional School, PEGS (Program for Exceptionally Gifted Students) and the fifth-grade STEM class at Holman. Students enjoyed meeting weekly to construct, code and drive a robot in preparation for the challenge. Meetings included assembling a game board and game structures; constructing the robot to run the game; practice running the game and working to improve their scores; and recording each meeting’s progress and ideas in a team engineering notebook. The student-built robots had to meet certain criteria to compete, including size and number of motors included. The competition at Holman included 56 team alliance matches during which two teams are on the board at the same time and work together to earn points. Teams also had to present their team engineering notebooks and take part in interviews with judges. Several teams also participated in optional robot skills matches that included tests of both driver-operated and autonomous robots that ran on code only. Holman fifth-grade STEM teacher Cheryl Gragert led the efforts to start the league. She secured a grant from the Pattonville Athletic and Activities Foundation (P2AF) to pay for robotics equipment, game boards and competition sets to start the elementary league for any interested Pattonville elementary school. The Pattonville community education department registered students for the program and funded coaches for the league as well as the competition. Holman eighth-grade Epic students and members of the Pattonville High School Robotics Club served as judges and referees at the Pattonville scrimmage. Several teams were recognized for their work during the competition. The Rubber Bandits of Wang Jangle and The Savage Robots, both from Willow Brook, earned the Teamwork Champion Award, which is given to two teams that collaborated to earn the highest points in the team alliance finals. The Savage Robots also won the Robot Skills Award for being the team earning the greatest number of points in single-team driver rounds plus any points earned in autonomous rounds. The Design Award was presented to the Ro-bits from Holman and was based on the team’s demonstration of the engineering process through their engineering notebook and team interview. Team Max Rules! from Rose Acres was selected for the Excellence Award which recognizes a team that is a contender in all competition areas and additionally shows exceptional sportsmanship, teamwork and enthusiasm. Above and below, Pattonville elementary students take part in an robotics league competition.